The first UNWTO Mayors Forum for Sustainable Urban Tourism, co-organized by the World Tourism Organization (UNWTO), the Ministry of Economy of Portugal and the Lisbon Municipality concluded Friday in Lisbon, Portugal. The event gathered Mayors and high-level city representatives from around the world, UN agencies and the private sector, to design a shared leadership aimed at ensuring that tourism helps creating cities for all. Under the theme ‘Cities for all: building cities for citizens and visitors’, the forum explored issues and solutions for developing and managing tourism in cities in a way that promotes economic growth, social inclusion and environmental sustainability. In a time of intense debate over the growing number of tourists and the livability and sustainability of cities, the forum exchanged ideas and good practices on urban tourism and destination management, discussed innovative tools and public policies on urban tourism at the national and local levels and way of promoting the integration of tourism into wider national and local urban development agenda. “The income generated from tourism contributes significantly to the socio-economic and cultural development of many cities and its surroundings. Yet, the growth of urban tourism also creates important challenges in terms of the use of natural resources, socio-cultural impact, pressure on infrastructure, mobility, congestion management and relationship with host communities. Tourism policies should thus be designed as integrated urban policies that promote a well-balanced city economically, socially and environmentally” said UNWTO Secretary-General Zurab Pololikashvili opening the event. The Portuguese Minister of Economy, Pedro Siza Vieira, acknowledged that “tourism is a major driver for the Portuguese economy. Portugal welcomes this first Mayors Forum as an international stage for discussing the challenges that urban tourism faces and how local communities can benefit the most from tourism. The Lisbon Declaration is a firm commitment from all participants so that tourism contributes materially to the Sustainable Development Goals”. The Portuguese Secretary of State for Tourism, Ana Mendes Godinho, added that “social sustainability in tourism is one of the main priorities in our 2027 Tourism Strategy. We launched a Sustainability Program for the development of projects by the civil society that involve local populations and tourists so that tourism leaves value in the territories”. Issues discussed include big data and innovative solutions, new business models, creative cities and events, infrastructure, resources and planning, local community engagement and empowerment and how to ensure the full inclusion of tourism in the wider urban agenda. Participating in the Forum were Gustavo Santos of Argentina, Secretary of State for Tourism of Argentina, Ana Mendes Godinho, Secretary of State for Tourism of Portugal, Isabel Oliver, the Secretary of State for Tourism of Spain, Mayors and Vice Mayors of 16 cities around the world (Barcelona, Bruges, Brussels, Dubrovnik, Helsinki, Lisbon, Madrid, Moscow, Nur-Sultan, Paris, Porto, Prague, Punta del Este, Tbilisi, Sao Paulo and Seoul), UNES>CO, UN Habitat, the World Bank, the European Committee of the Regions as well as Amadeus, Airbnb, CLIA, Expedia, Mastercard and Unidigital. The Forum adopted the Lisbon Declaration on Sustainable Urban Tourism, in which participants reinforced their commitment to align urban tourism policies with the United Nations New Urban Agenda and the 17 Sustainable Development Goals, namely Goal 11 – ‘Make cities and human settlements inclusive, safe, resilient and sustainable’. The Lisbon Declaration on Sustainable Urban Tourism will be presented at the twenty-third session of the General Assembly of UNWTO, to be held this September in St. Petersburg, Russia. During the event, UNWTO Secretary-General and the Mayor Bakhyt Sultanov of Nursultan (Kazakhstan) signed an agreement for the hosting of the 8th UNWTO Global Summit on Urban Tourism, to be held on 9 to 12 October 2019. 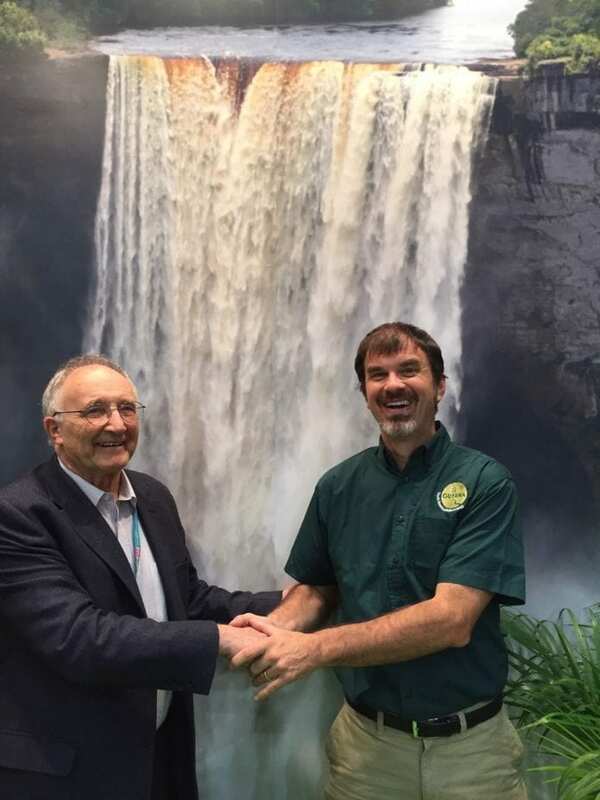 Guyana which has been named the #1 “Best of Ecotourism” destination and one of the world’s Top 10 Sustainable Destinations at this week’s ITB Berlin is teaming up with SUNx to bring Climate Change education into its Travel & Tourism sector. Guyana’s ITB Award reflects its authentic Green Tourism, its holistic approach to sustainable destination management, and integration into the quality of life for all its citizens. As an immediate step Mullis announced an SDG17 Partnership between the Guyana Tourism Authority and the SUNx Program – a legacy program for Maurice Strong, the father of Sustainable Development – to kickstart its “Plan For Our Kids” in Guyana. Professor Geoffrey Lipman, co-founder of SUNx noted its lifetime learning system for Climate Friendly Travel ~ measured: green: 2050 proof. SUNx plans to use it to create 100,000 STRONG Climate Champions by 2030, across all UN States to support transformation to the New Climate Economy. “We will enrol a top Guyanese Student, as a beach head for the program in the country and work with the stakeholders in the sector to boost membership in the years ahead. Our strategic vision is for the sector to conform to Paris Climate Targets by 2030 and we believe that the “Plan For Our Kids” will make a big difference”. Visitor surety is a top priority for Jamaica Tourism. Dr. Andrew Spencer, Executive Director of the Tourism Product Development Company Ltd. (TPDCo) appointed Dr. Peter Tarlow, Partner of certified.travel, as the head of the new National Jamaica Tourism Security team. TPDCo is the organization charged with the responsibility for Destination Assurance under the directive by its Honorable Minister, Edmund Bartlett, MP. This follows a number of meetings between Dr. Tarlow and the Hon. Edmund Bartlett, Jamaica Minister of Tourism, with Jamaica Minister of National Security, the Hon. Dr. Horace Chang, and senior members of the Ministry of Tourism (MOT) and its agencies. Dr. Peter Tarlow pointed out: “Tourism is the world’s leading peaceful industry and a major economic development tool. The tourism industry is also security (crime and terrorism) sensitive, and a lack of tourism surety has a major impact on tourism and event-oriented economies. Additionally, when public officials are tourism-sensitive, they offer the general public better service, economic opportunities, and an improved standard of living. “The hospitality industry’s number one job is to protect its guests, and visitors demand safety and security by well-trained professionals. If the tourism industry fails in this regard, all else becomes irrelevant. Unfortunately, within the last few months, Jamaica has had to deal with several incidents that have challenged the perception of its security in relation to visitation safety. These incidents have impacted the perception of Jamaica’s tourism product both locally and globally.